Spring ephemeral plants bring beauty and charm to the earliest part of the growing season, and also have important value to the ecosystem. These plants put a lot of energy into producing blooms, creating large blossoms relative to the size of the plant. They emerge quickly in spring, taking advantage of the high levels of sunlight that reach the forest floor before the leaves emerge in the canopy. They often die back to their underground parts (roots, tubers, rhizomes) when they are done blooming. Beeflies, halictic bees, mining bees, and syrphid flies, as well as some of our early season skippers, relish early blossoms as they gather nectar for energy. The trout lily miner bee (Andrena erythronii) feeds almost exclusively on the early nectar of trout lily blossoms. Though it does feed on other species of flowers, their numbers are greatest where trout lily populations are strong and present. Similarly, Virginia Spring Beauty hosts the spring beauty miner bee (Andrena erigeniae). Busy pollinators need more than nectar. Leaves also play a crucial role in their life cycles. For example, sundial lupine leaves are eaten by the larva of the federally endangered Karner blue butterfly. This butterfly has two reproductive cycles a year. In spring, and again in summer, a new brood of larva feed on the lupine leaves. 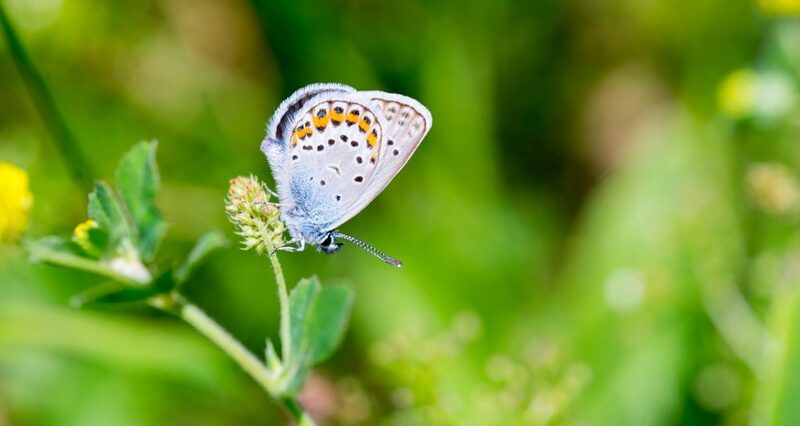 Without the lupine, this tiny butterfly would become extinct. The role of spring ephemerals in the ecosystem is intricate and multi-faceted. 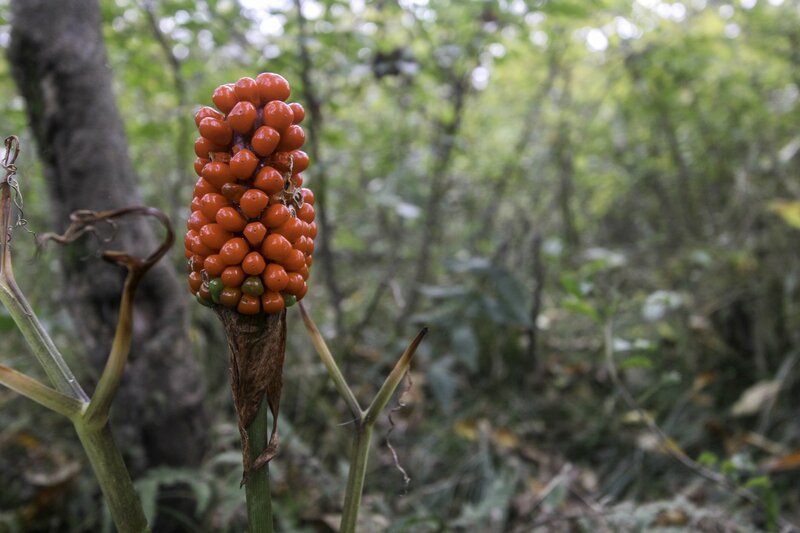 One example is Jack-in-the-Pulpit. The flower emits an odor similar to that of many woodland fungi. Fungus gnats usually lay their eggs on fungi, and their larvae hatch and then eat the fungi. 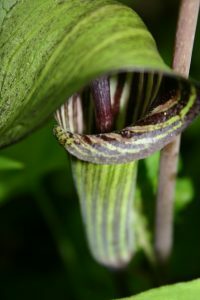 Jack-in-the-Pulpit odor lures the gnats into its flowers, where the gnats will find themselves trapped. The male flower has a small opening that allows the pollen-covered gnat to escape. When these gnats fly to female plant, they deposit the pollen, and are once again trapped. There is no escape from the female flower, and the gnats will ultimately die inside. 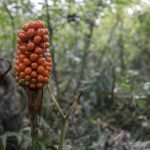 Meanwhile, they will have pollinated the Jack in the Pulpit so it can produce the succulent red fruits that are savored by a variety of woodland birds including wood thrush, turkeys, and grouse. The berries readily produce new plants, the corms of which are a favorite treat for black bears. Native bees and flies may pollinate bloodroot flowers — and get pollen in return — provided the early spring weather is warm enough for them to be active. If not, the flower is able to self-pollinate, with its anthers (male part) reaching down to deposit pollen in the stigma (female part). Certain native ants have a win-win relationship with bloodroot. They carry the bloodroot seeds to their homes and eat the seeds’ nutritious outer layer. The bloodroot seeds are still viable after the ant feast and are protected in a chamber within the ant nest. This chamber, along with the ants’ refuse of organic matter, provides a fertile place for the seeds to germinate. While bloodroot does spread by its rhizomes, the additional boost from ants serves to speed up the process, helping bloodroot populations to expand at a time when destruction of its habitat is rampant. Spring ephemerals and early pollinators support each other. Without the ephemerals, pollinator diversity would crumble due to lack of nectar and habitat. Without the pollinators, woodland plant species would lack genetic diversity and struggle to set seed for a new generation. Each spring ephemeral species has its own unique connection to the ecosystem. Most likely, there are relationships we don’t even know about yet. It’s all a part of the intricate web of the ecosystem, and each native species is important. We carry many of these spring ephemeral species in limited quantities. Check in with us to see what we have in stock at any given time. –Watch for Part Three: Using Spring Ephemerals in Your Garden.